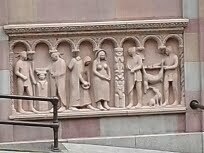 Saw this beautiful Frieze during a walk in Downtown Seattle. It’s always so nice to find hidden gems in buildings. I don’t know what’s going on in the picture so if anyone knows, feel free to say so in the comments. What hidden gems have you found in your town?